The Auditor-General’s report has exposed a N2 billion financial scandal in the National Assembly expenditure, according to document seen by Daily Trust. The revelation came at a time the National Assembly has been under increasing pressure to make its budget expenditure open. But why is National Assembly budget shrouded in secrecy? Details of the lawmakers’ annual budget of over $100 billion have been shrouded in secrecy since 2010. The AGF’s annual report, exclusively obtained by our correspondent, said the illegalities were perpetrated in 13 transactions. The transactions involved both chambers of the National Assembly, the Management as well as the National Assembly Service Commission (NASC), and the National Institute for Legislative Studies (NILS). The report said House incurred the highest infraction of N1.1 billon followed by Management, N347.8 million; NILS, N246.5 milliion; the Senate N205.7 million; legislative aides N70 million and NASC,N30 million. The annual report for 31st December 2015 was laid on the floor of the Senate on Tuesday by the Senate Leader, Senator Ahmad Lawan. The Senate President, Bukola Saraki referred it to the Senate Committee on Public Accounts for further legislative actions. The committee was given four weeks to look into the matter. At the House, the Auditor-General observed that contracts for the purchase of 48 Units of Utility Vehicles were awarded to three contractors at N624 million. Also at the House, the Auditor-General said 50 cash advances amounting to N499.6 million were granted to staff to carry out various assignments. “However, as at the time of writing this report in August, 2016, more than a year after, the advances are yet to be retired. “Some of the vouchers were granted multiple advances without retiring the previous ones in violation of the Financial Regulations which provides that no new advance should be granted, if the previous ones had not been retired” it stated. The report said that the Clerk of the National Assembly had been requested to recover the advances from the affected officers and furnish the Auditor-General with the recovery particulars for audit verification. 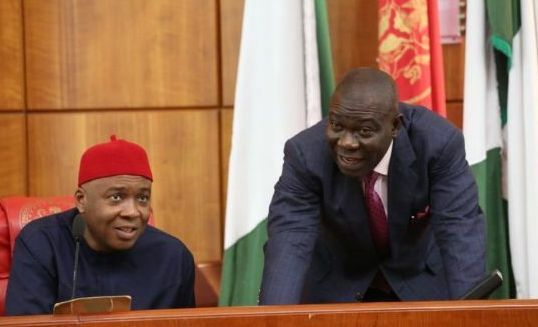 For the Senate, the Auditor-General’s report said N186million meant for the payment of Motor Vehicle Loan which was paid into a Commercial Bank Account as indicated in the mandate was misapplied for other purposes such as organizing Senate Retreat and Pre-Valedictory Session of the 7th Senate. This action, according to the report, violates the provision of Financial Regulations 417 which states that, “Votes must be applied only to the purpose for which money is provided. Expenditure incorrectly charged to a Vote shall be disallowed”. The Clerk of the National Assembly has been notified and requested to explain reasons for the Violation of extant rule. He was also asked to recover the fund and forward the particulars for audit verification. Still on the Senate, it was observed that Bank Charges amounting to N15.9 million were charged for the period July to December, 2015. “This is contrary to the provisions of e-Payment Circular Ref no. TRY/A8/88/2008 which requires that individual benefits and claims should be effected through their personal Bank accounts. Financial Regulations 734 also provides that ‘’ No Government Organization or Agency shall place government funds in any Commercial Bank that will charge any commission on transactions “. The Clark has been asked to recover the amount and furnish the Auditor-General with the recovery particulars for audit verification. The Clerk has been requested to pay back the money and furnish the Auditor-General with the payment particulars for audit verification. It also observed that account payment vouchers amounting to N115.9m paid by the Management within the first 6 months of the financial year 2015, were not produced for audit examination. “Therefore, I cannot attest to them as proper charges against public funds. The Clerk of the National Assembly has been requested to produce the vouchers or recover the total sum under reference, and the particulars forwarded for audit verification,” it reads. It was further observed that Cash Advances totalling N158million granted to members of staff in 17 instances between the months of January and June 2015 are yet to be retired at the time of writing this report in the month of August 2016, (more than a year after payments) in flagrant disregard of extant regulations which stipulate that all advances should be retired/accounted for, immediately after the completion of the assignment for which funds were granted. The Clerk has been communicated that the defaulters should be sanctioned in line with the provision of Financial Regulation. During the Audit of National Assembly Budget & Research Office (NABRO) account, financial scandal of N66million was observed. It said there was Vital/relevant supporting documents. The Audit of the Personnel Accounts of the Legislative Aides revealed that a total sum of N78.5million was expended on the payment of Overtime/Special Allowances to officials who are not Legislative Aides, in the months of November and December 2015. “This payment found to be irregular has been brought to the attention of the Clerk of the National Assembly. He should produce the enabling authority, otherwise he should return the sum of N70, 560,000.00 to Government Treasury and furnish Auditor-General with the recovery particulars for verification,” the report stated. In case of the National Assembly Service Commission, an amount totalling N17million was deducted from four months’ salaries by the commission in the year 2015 as PAYE (Pay As You Earn) and claimed to have been remitted to the Federal inland Revenue Services without any evidence of payment to FIRS.